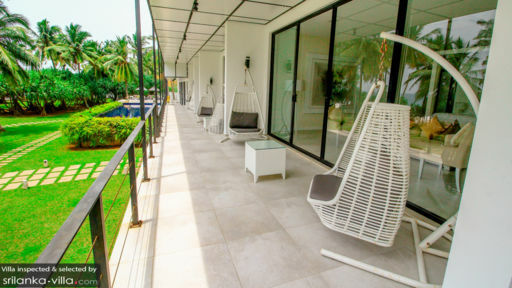 Set along the Southern coast of splendid Sri Lanka, Green Turtle Villa is in Kosgoda, Galle district, right next to a turtle hatchery. 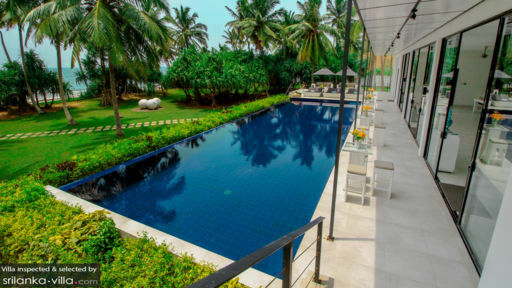 With beautiful ocean views, this beachside location is idyllic to say the least what with its private pool, luscious gardens, and the neighbouring beach. Sporting a contemporary layout, the villa is in vibrant contrast to the understated nature that lies right outside its doors. An added bonus is the villa’s own pet pooches, amicable and friendly to make your stay all the more entertaining and memorable. With four bedrooms, the villa can accommodate quite a few guests which is great if you’re travelling in a group. The bedrooms are furnished with king-sized beds and feature private seating areas for convenience. Curl up with a good book, enjoy the view from the large glass windows and doors, or simply laze around on your comfy beds for the most relaxing of times. There are dressers and chairs in each room so you can ready and store all your belongings with ease. The bedrooms are air-conditioned and have en-suite bathrooms that are luxurious and fitted with freestanding bathtubs, toiletries, and more. Dappled with towering palms trees, the verdant gardens of the villa lead inadvertently to the sandy shores of the beach, where the sunset is almost an out-of-body experience. Relax on the thatched-roof pavilion located right beside the sea, lounge on the daybeds found next to the private swimming pool, or swim around the pool’s cool, crisp waters. Dine alfresco style on the elegant outdoor chairs and tables on the pool deck or play with the adorable dogs while running amok on the green, green grass! An intrinsic aspect of a beach villa is open-plan living where the purpose is to bring guests closer than ever to nature and its many delightful treats. The living room at the Green Turtle Villa where the sea is just where you’d want it to be, the sliding glass doors let you breathe in the tropical air as and when you wish. 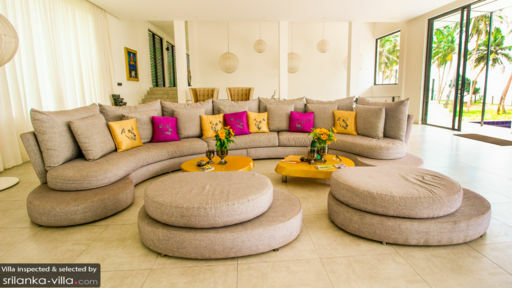 Leave the doors open to the palm-tree frenzied gardens and the pool while relaxing on the grey, circular couches specked with colourful cushions. The white interiors are purely complementary to the vivid colours outdoors, and the modern. An entertainment room with modern furnishings including bright-red armchairs, jail-striped couch, and a flat-screen TV mounted on the wall! A 12-seater dining table, pristine white, is found in the living room just off the seating area, a perfect place to eat with friends and family. You will find outdoor seating to your liking where you can enjoy the pleasant weather and calm surroundings. Bright artwork on the walls bring this room to life and the intriguing artefacts lining the cabinet only add to the quaint charm of this space. The villa has its own resident staff and in-house chef to cater to your needs and to keep you happy during your stay. They can arrange for most everything for you including whale watching tours, private yoga classes, Madu Ganga river safari, and massages upon request. Surrounded by exciting things to do including the turtle hatcheries, where new turtle hatchlings are a common sight and you can even help release them in to the sea! Visit the popular Galle Fort, deemed a UNESCO World Heritage Site, go on heritage walks, and immerse yourself in nature for good measure. Enjoy a tour of the Moonstone mines through the forest for a first-hand mining experience. There's a good restaurant especially for sea food and local dishes, it's name is Aida. The place was perfect . I recommend it especially for larger family. My request is the villa need be equipped with washing machine. In fact during our short stay we only used the chef for preparing one.lunch, the rest we prepared our own foods.